2009/2010 Rotary International Theme: "The Future of Rotary is in Your Hands"
"Participating Rotarians Involved Do Excel". Ã¢â‚¬Â¢ Schedule introductory meeting with all Board and Committee Chairs NLT 18 February to discuss Rotary Year 2009/2010 Goals and Responsibilities. Ã¢â‚¬Â¢ Request Board and Committee Chairs to establish teams, goals and accountabilities for 2009/2010 by 2 June 2009. Ã¢â‚¬Â¢ Plan Installation Banquet for 2009 outgoing President and 2009/2010 incoming President-Elect. Ã¢â‚¬Â¢ Schedule a Club Assembly to introduce and train membership in use of ClubRunner system for information access and communications among Rotary Members, District and Rotary International Sites. Ã¢â‚¬Â¢ > 10% Membership increase and emphasis on Membership Retention. Ã¢â‚¬Â¢ Greater involvement in all SLRC Committees - better communication of available opportunities to serve. Ã¢â‚¬Â¢ > 80% Weekly Meeting Attendance - create a "want to attend". Ã¢â‚¬Â¢ 100% participation in Club Fundraiser - Create Committee Organization and Committee Chairs by January 6, 2009 for "Shrimpfest", scheduled for September 12, 2009. Ã¢â‚¬Â¢ Schedule Quarterly Club Assemblies to communicate progress on Goals. Ã¢â‚¬Â¢ Create Club Meeting Schedule for the Rotary Year 2009/2010 with Monthly themes and Meeting Dates to facilitate scheduling by the Program Chair. Ã¢â‚¬Â¢ Review SLRC Bylaws with the Board and distribute to the Club by month end August 2009. Ã¢â‚¬Â¢ Develop local and International projects as opportunities are found. Ã¢â‚¬Â¢ Cooperate with the District Governor as needs are communicated. Ã¢â‚¬Â¢ Bring the 2010/2011 SLR President-Elect into the current year planning process. Ã¢â‚¬Â¢ Develop SLRC Operating Budget to effectively guide us through the 2009/2010 Rotary Year. Ã¢â‚¬Â¢ Emphasize importance to Club Members for attending District Assembly, District Conference, District Governor Installation, Club President Installation and District All Club Meeting. Ã¢â‚¬Â¢ Assist with implementation of major fundraiser "Shrimpfest 2009"
Ã¢â‚¬Â¢ Work with 2009/2010 SLRC President and Board to prepare for 2010/211 President Year. Ã¢â‚¬Â¢ Assist Club President with duties as assigned. Ã¢â‚¬Â¢ Take Weekly Meeting Attendance records along with Visitor and Visiting Rotarian Sign-up Sheets and name tags. Ã¢â‚¬Â¢ Prepare and send Monthly Attendance Reports to the District prior to deadline requirements. Ã¢â‚¬Â¢ Prepare and send Semi-Annual RI and District Reports prior to deadline requirements. Ã¢â‚¬Â¢ Develop and maintain SLRC Committee Participation database. Ã¢â‚¬Â¢ Recognize Monthly and Annual SLRC Perfect Attendance Performance. Ã¢â‚¬Â¢ Prepare Monthly Secretary Report to SLRC Board and to SLRC Membership after Board Meeting presentation. Ã¢â‚¬Â¢ Using ClubRunner and coordinating with Sgt-At-Arms, recognize monthly Birthdays and Anniversaries. Ã¢â‚¬Â¢ Maintain SLRC Membership Roster on ClubRunner and post all membership input (keep it up to date) on RI database as well. Ã¢â‚¬Â¢ Train one back-up Club Secretary no later than 1 October 2009. Ã¢â‚¬Â¢ Develop a Club Operating Budget NLT than March 1, 2009. Ã¢â‚¬Â¢ Collect and record Weekly Meeting Luncheon costs. - Coordinate with SWCC Staff to reconcile lunch costs. Ã¢â‚¬Â¢ Present Monthly Financial Report at Monthly Board Meetings. Ã¢â‚¬Â¢ Provide summary of Club Financials to Membership on a quarterly basis. Ã¢â‚¬Â¢ Assist Club Secretary with preparation of Semi-Annual Report to RI and District. Prepare checks for payments to RI and to District to cover membership dues, etc. Ã¢â‚¬Â¢ Prepare signature cards for all qualified incoming officer signatories and ensure two signatures on documents are enforced as required. Ã¢â‚¬Â¢ Maintain financial records for SLRC. Ã¢â‚¬Â¢ Train as back up, one new Club Treasurer no later than 1 October 2009. Ã¢â‚¬Â¢ Develop a Contribution Budget Proposal in coordination with the Contribution Review Committee and the incoming Board by 1 May 2009. Ã¢â‚¬Â¢ Conform to Contribution Budget or make recommendations and corrections to the Board throughout the Rotary Year. Ã¢â‚¬Â¢ Work with Community Service Chair and Club President to prepare Matching Grants opportunities from the District. Ã¢â‚¬Â¢ Select Participants for Prayer, Flag Salute, 4-Way Test, Guest Introduction and Sunshine & Showers. Ã¢â‚¬Â¢ Set up a weekly fundraiser raffle. Ã¢â‚¬Â¢ Recognize Birthdays and Anniversaries at beginning of each Month. Ã¢â‚¬Â¢ Start moving to start Weekly Meetings at 12 Noon sharp. End meetings at 1:00 PM sharp. Ã¢â‚¬Â¢ Select and train secondary Sgt-At-Arms as back up no later than 1 October 2009. Ã¢â‚¬Â¢ Coordinate efforts of Rotary E-Bulletin Editor to reflect up to date information dissemination to all members on a weekly basis. Ã¢â‚¬Â¢ See that the SLRC Bylaws reflect the current thinking of RI. Ã¢â‚¬Â¢ Establish a "Social Committee" by June 1, 2009, to bring more fellowship opportunities for the whole Club to participate: Christmas Party, Family event or other fun events - goal to be at least one per quarter. Ã¢â‚¬Â¢ Work with the Rotary College Chair to conduct meaningful Rotary College training classes on a timely basis. Ã¢â‚¬Â¢ Follow up with the Membership Chair and Red Badge Chair to have a process of procuring new members, retaining existing members, bringing back qualified members who have exited the Club and making the new members feel welcome in Sugar Land Rotary Club. Work together to improve the weekly meeting attendance - to be 80% each week. Ã¢â‚¬Â¢ Work with Rotary Foundation Chair to educate and encourage 100% participation in Paul Harris/Rotary International Foundation funding. Ã¢â‚¬Â¢ Organize a working committee to support our Community Service goals - by June 1, 2009. Ã¢â‚¬Â¢ Prepare Budget for Community Service Projects. Ã¢â‚¬Â¢ Identify Club Projects not completed in 2008/2009 Year and plan to complete in 2009/2010. Ã¢â‚¬Â¢ Encourage 100% Club participation in Santa's Exchange activities. Ã¢â‚¬Â¢ Work with Veteran's Day Chair to make a successful Veteran's Day Recognition Luncheon to honor our area Veterans. Ã¢â‚¬Â¢ Organize a Hearts and Hammers project in our area to be completed by this Rotary Year end. Ã¢â‚¬Â¢ Set up Thanksgiving and Christmas food basket distribution to seniors via Club Members during the holiday Season. Ã¢â‚¬Â¢ Working with Club and Community members, identify other opportunities and organize team members for projects to serve our community. Ã¢â‚¬Â¢ Work with the International Service Chair to continue with Living Water and Hearing Aid Project work for International community Service Projects. Ã¢â‚¬Â¢ Form a team to work on Vocational Projects during 2009/2010 Rotary Year. Ã¢â‚¬Â¢ Organize < 2 Teacher Recognition Programs for Public Schools and 1 Teacher Recognition Program for Private Schools in our area. Ã¢â‚¬Â¢ Create a Business Awareness Day to recognize local Businesses. Ã¢â‚¬Â¢ Identify and recognize local governmental activities that have resulted in bettering citizen's lives in our community. Ã¢â‚¬Â¢ Incorporate Vocational Service articles in the Weekly Bulletin using HR and other resources that illustrate the use in business of the 4-Way Test Principles. Ã¢â‚¬Â¢ Plan to host one Foreign Exchange student using three Host Families - trying to remain in the attending school area. Ã¢â‚¬Â¢ Provide as much visibility to our Host Student as possible - attending Rotary Meetings, speaking to our Club and including the student in other events as scheduled. Ã¢â‚¬Â¢ Support District GSE Team visit. Ã¢â‚¬Â¢ Stay involved with other Rotary International Projects as made available - outgoing GSE Team Leaders, Ambassadorial Scholarship, Rotary Grant for University Teacher and Rotary Peace and Conflict Studies Fellowship. Ã¢â‚¬Â¢ Seek a Rotary Foundation Matching Grant for a water and health project. Ã¢â‚¬Â¢ Use Club Members to develop a "wish list" of speakers and club members to help fulfill those wishes. Ã¢â‚¬Â¢ Bring in speakers that will enlighten Sugar Land Rotarians. Ã¢â‚¬Â¢ Schedule first 6 months of 2009/2010 programs by June 1, 2009. Ã¢â‚¬Â¢ Observe the Rotary Monthly Program Emphasis. Ã¢â‚¬Â¢ Develop 2009/2010 Program Committee by 1 March 2009. Ã¢â‚¬Â¢ Identify and prepare speaker mementos to be awarded at the end of the weekly program presentation. Ã¢â‚¬Â¢ Coordinate with the special observance program chairs to meet the meeting requirements for the occasion. Ã¢â‚¬Â¢ Identify presentation needs of the speaker such as projector, screen, mike - etc. Ã¢â‚¬Â¢ Prepare contingency plans in case scheduled programs are cancelled. Ã¢â‚¬Â¢ Form a Membership Committee by 25 March 2009. Ã¢â‚¬Â¢ Develop membership goals / activities by 1 April 2009. Ã¢â‚¬Â¢ Increase membership by 10% (based on July 1 numbers) with a stretch goal of 15% through Rotary Year end 2010. Ã¢â‚¬Â¢ Develop a Member Retention Plan - Initiate an exit interview form for those members leaving the membership of Sugar Land Rotary - in order to improve our existing membership expectations. Ã¢â‚¬Â¢ Create a New Member Mentor Plan that makes new members feel better integrated into our organization - and also make them feel important. Ã¢â‚¬Â¢ Assign a Red Badge Chair and continue the Red Badge Program to include "graduation recognition" when receiving the Club Membership Badge. Ã¢â‚¬Â¢ At each Rotary Meeting - recognize new members. Ã¢â‚¬Â¢ Induct new Rotary Members into the Rotary Club on a timely basis < 2 weeks following Rotary College and accepting the invitation to join Sugar Land Rotary. Ã¢â‚¬Â¢ Assign Red Badge Members to standing Club Committees. Ã¢â‚¬Â¢ Review ex member list to find and reinstate back into active membership. Goal of at least three reinstated in this Rotary Year. Ã¢â‚¬Â¢ Survey Sugar Land Community professionals interested in community service via Sugar Land Rotary. 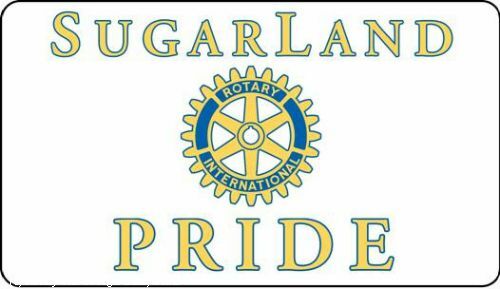 Ã¢â‚¬Â¢ Determine and correct reasons for low attendance at Sugar Land Rotary Meetings. Ã¢â‚¬Â¢ Develop a "New Member Moment" presentation for each meeting to keep our membership goals in front of the Club at all times. Ã¢â‚¬Â¢ Review Classification system and update for Sugar Land Rotary potential new member areas. Ã¢â‚¬Â¢ Follow District 5890 Membership Team requests and guidelines. Ã¢â‚¬Â¢ Make each new member feel welcome and want to continue membership with goal to keep 100% of new members engaged. Ã¢â‚¬Â¢ Get each new member through the program within three months. Ã¢â‚¬Â¢ Obtain mentors for each new member that will actively communicate with new member - 100% engagement of old members to new members. Ã¢â‚¬Â¢ Establish a Foundation Committee to work on the year's projects. Ã¢â‚¬Â¢ Review Club's current involvement with Foundation programs. Ã¢â‚¬Â¢ Review Club's financial contributions to the Rotary Foundation. Ã¢â‚¬Â¢ Set Club's financial contribution and program participation goals for the year. Ã¢â‚¬Â¢ Contact district Rotary Foundation committee chair to find alumni or volunteers to share with the Club, their experiences with the Rotary Foundation. Ã¢â‚¬Â¢ Encourage 100% participation in the Rotary Foundation funding. Ã¢â‚¬Â¢ Do the in-Club District Foundation raffle ticket distribution to Club members and "keep the books" on ticket receipts for return to the District. Ã¢â‚¬Â¢ Develop a formal communications plan and form a working Publicity committee to help throughout the 2009/2010 year. Ã¢â‚¬Â¢ Develop a news media contact list to publicize Sugar Club meeting dates and activities tied to the community at large. Ã¢â‚¬Â¢ Work with the Club Bulletin Editor to communicate news items to Club Membership. Ã¢â‚¬Â¢ Serve as Club Spokesperson when working with the media. Ã¢â‚¬Â¢ Provide updates to business and civic leaders regarding Rotary's mission and our Club's community efforts. Thanksgiving and Christmas Food Baskets. Ã¢â‚¬Â¢ Establish Shrimpfest Date of 12 September 2009 by September 2008 Shrimpfest date. Ã¢â‚¬Â¢ Establish 2009 Shrimpfest Organization structure by 1 December 2008. Ã¢â‚¬Â¢ Complete Shrimpfest planning by 20 May 2009 - ready to implement no later than 12 August 2009. Ã¢â‚¬Â¢ Establish goal of not less than $100,000.00 net profit. Ã¢â‚¬Â¢ Develop donor / solicitor database for community publicity of event. Ã¢â‚¬Â¢ Involve 100% of Club membership in the planning and execution of the Shrimpfest event. Ã¢â‚¬Â¢ Hold Club meetings to communicate goals, activities and critical dates to our membership. Ã¢â‚¬Â¢ Make Sugar Land Rotary Club Shrimpfest a noteworthy Sugar Land community annual event for the ability to fund recognized needs within our community. Ã¢â‚¬Â¢ Recognize all participants in the successful completion of this community project. Ã¢â‚¬Â¢ Announce meeting schedules, speakers, etc. and other pertinent information to all Sugar Land Rotarians via ClubRunner weekly bulletin. Ã¢â‚¬Â¢ Set up to include pictures as appropriate. Ã¢â‚¬Â¢ Send out E-bulletin at least one day prior to scheduled meeting date. Ã¢â‚¬Â¢ Assemble committee for Veteran's Day recognition no later than 8 July, with the date for the event set to be Wednesday, November 11, 2009 at the SWCC - noon meeting time. Ã¢â‚¬Â¢ Arrange for appropriate speaker. Ã¢â‚¬Â¢ Prepare agenda for the recognition event. Ã¢â‚¬Â¢ Set up Veteran invitation process. Ã¢â‚¬Â¢ Develop budget for the event. Ã¢â‚¬Â¢ Make this a memorable Veteran's Day Recognition event. Ã¢â‚¬Â¢ Establish committee chairs by 8 July 2009. Ã¢â‚¬Â¢ Set up committee meetings necessary to plan and execute a successful 2009 Santa's Exchange Project. Ã¢â‚¬Â¢ Determine required budget for Santa's Exchange by 8 July 2009. Ã¢â‚¬Â¢ Determine the Santa's Exchange process to be used for 2009. Ã¢â‚¬Â¢ Communicate needs and assignments as necessary throughout the planning period prior to Santa's Exchange day. Ã¢â‚¬Â¢ Recognize participants involved in making Santa's Exchange a success. Ã¢â‚¬Â¢ Get 100% of current and new Rotarians set up and actually using ClubRunner. Ã¢â‚¬Â¢ Be the Club net worker to determine member needs, illness, bereavements and other notable occasions for the Club to be made aware and stay in touch with our affected members. Ã¢â‚¬Â¢ Provide cards or flowers if necessary to show our membership concern for our Rotary family situations.